Representing love and wisdom, pearls have long been treasured as objects of natural beauty and awe. 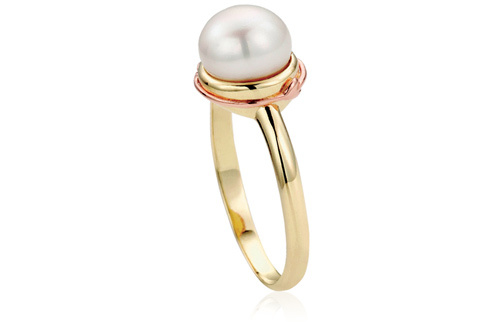 As a symbol of purity and innocence, the pearl is favoured by brides-to-be. A single fresh-water pearl, surrounded by a 9ct rose gold vine, sits on a 9ct yellow gold band inscribed with the Welsh word 'Cariad' meaning beloved, darling or sweetheart. Included within the Tree of Life Pearl ring is rare Welsh gold, making it a truly unique piece of jewellery to be treasured forever.